What are they talking about at COP23? About ten thousand people are attending the 23rd Conference of Parties (COP) on climate change. Didn’t they just decide something in Paris two years ago? Why do they have to keep meeting every year? Craig Morris asks the experts. 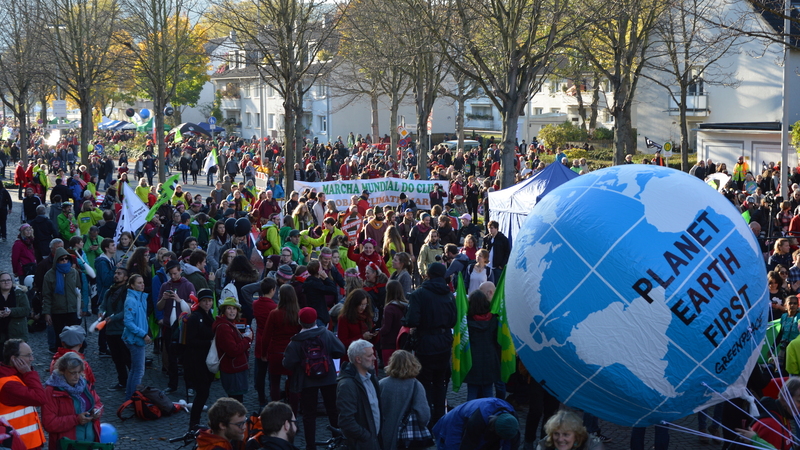 From November 6-17, 2017, some 25,000 delegates and visitors descend upon Bonn, Germany, for COP23 under the Fuji presidency. They meet in temporary buildings (heated with oil) and some may stay a bit longer hammering out details of an agreement on emission reductions. What else is there to discuss? In 2015, the Paris Accord was signed. It marked a breakthrough in climate policy – not because of the targets, which remain insufficient: the pledges would bring global warming down from 3.6°C to only 2.8°C, far from the 2.0°C aimed for, much less the 1.5°C acknowledged to be necessary. Rather, Paris was a breakthrough because it broke with the old Kyoto approach. In the Kyoto Protocol, countries negotiated binding targets. “Annex” countries were to reduce their emissions; non-Annex countries (developing nations) had leeway to increase theirs. The countries thus fought over what was fair. The approach didn’t work. The US never joined; no Democrat or Republican senator would ratify it. Canada joined but left when it would have had to pay fines. At COP 15 in Copenhagen in 2009, a decision was made to change the approach, which had failed. The idea was that pledges should be non-binding, and there would be no penalties. Under Kyoto, each country would theoretically pledge to do more in order to encourage others to be more ambitious – hence Germany’s unrealistic pledge of a 40 percent carbon emissions reduction by 2020. But in practice, it worked the other way around: there was a race to the bottom. The spirit could be summed up as: “If they don’t do more, we’ll do less.” The Kyoto approach thus encouraged a lack of ambition, the opposite of what Germany – which hosted three of the first six COPs to ensure the process continued – wanted. By 2009, people had lost confidence in the process. How could confidence be restored? By 2015, Paris had replaced Kyoto’s penalties with the “name-and-shame game” in order to switch from policing to peer-pressure (literally). All pledges are now voluntary, and some of them make little sense, lacking even a baseline (30% relative to what?). The only penalty is that people like me and you get to point the finger. “There are just limits to compliance,” Elmar Kriegler of PIK explains the new approach, which he says is “more about nudging.” Kyoto proved to be unenforceable. But peer-pressure? It’s hard to imagine how that could even be stopped. In this respect, Paris represents a paradigm shift. The delegates often work frantically, sleeping little and staying longer than planned. Given those poor conditions, it’s not surprising that the documents themselves are less than perfect. “If you look at the first version of the Paris agreement, you’ll see there’s a paragraph missing,” explains Navina Sanchez, associate lecturer at the University of Cologne. “It jumps from 35 to 37. And there are articles that are interrelated but contradict each other.” One example is reporting schedules, which do not always overlap. In Paris, delegates basically raced to fill in the blanks from a template agreed on in 2014 at COP20. “In Lima, we came up with some 70 pages of text. Everything was in brackets, but there was a structure,” Sanchez says. That structure was possible because the idea of pledges (INDCs or intended nationally determined contributions) had been invented in 2013 at COP 19 in Warsaw. In turn, the INDCs were possible because of the insight at COP18 in Doha that a paradigm switch was needed – in 2012, the year that the Kyoto Protocol expired. The Paris agreement thus took shape gradually, and it will continue to evolve. “I think the agreement came about because it included mechanisms to make it gradually enforceable,” says Manuel Pulgar Vidal of the WWF. For the time being, the only penalties are peer-pressure. It’s thus important that people like you and me play the name-and-shame game. So please do take part. For now, it’s all we’ve got. Direct quotes were taken from episode 2 of Craig’s new podcast for the IASS on Human environments in a changing world. Right. Let’s add that the approach only works because two new factors have eliminated the “free rider” problem, that is that countries feared they would have to spend a lot of money while other countries would get most of the benefits even if they didn’t do anything. So the rational strategy in game theory was to defect and do nothing. The first change was the crash in the cost of renewables. The energy transition now costs nothing overall (so say the IPCC and everybody else who has studied the matter), though it has big winners and losers: the conflict is a domestic one between interest groups, not an international one between states. A single country now gets some climate benefit from its own policies, and that should be enough, though there is a much larger payoff from cooperation. The second has been the realization of the massive health costs of air pollution from coal and transport fuels (not as it happens from natural gas). The world total of $4 trn a year or whatever does not matter here – these costs are primarily within states, indeed within much smaller regions, and are well represented in domestic politics. This pressure holds within undemocratic countries like China, as long as the oligarchs or autocrats are rational and fear popular anger. Chinese policy is much more driven by air pollution in cities than by climate change, though the policy solutions are the same.